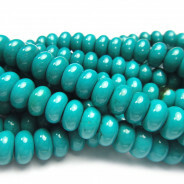 Reconstituted Turquoise 13x18mm Drop Gemstone Beads (25pce Strand) - 40cm/16'" Strand. 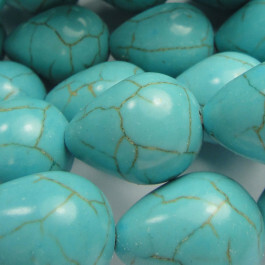 Turquoise meaning "Turkish Stone" comes from European markets in the Middle Ages, who received it from Turkish traders who brought it from Persia. 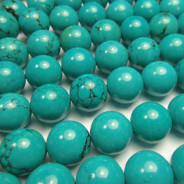 Turquoise beads were used by the Egyptians as early as 5500bc. The Navajo and Hopi (Native Americans) in Arizona value Turquoise as an attractor of prosperity and fertility of the soil and treasure it as a powerful success and good luck stone. Supposed to be a stone of communication, making one more eloquent, loving, creative and honest. Also considered a stone of friendship. 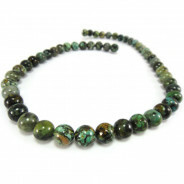 These beads are Turquoise of a lesser grade which has been ground down into a powder. The powder is permeated with epoxy resin, then dyed and compacted into blocks before being cut to shape.